The Business Trust is a partnership between business and government that has worked to improve public services and develop inclusive markets. 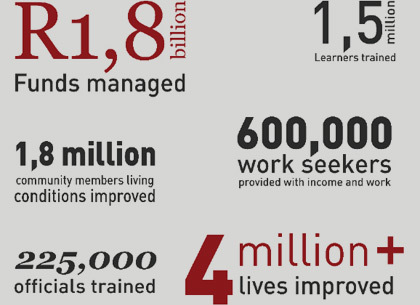 Set up as a short term venture in 1999, it has managed R1,8billion in corporate and government funding and positively impacted on the lives of 4 million people. 'Changing Lives' is an exhibition of photos that captures the story of some of those people. It connects us to teachers, firefighters, entrepreneurs, students, farmers, investors and young people on their first job. These are some of the stories of the Business Trust. It shows us by working together, we can achieve great things. Visit the Business Trust website for more information on its partners, programmes and results. © Business Trust 2011. All Rights Reserved.